Set on 3 floors and accessible by stairs, rooms are fitted with a flat-screen TV with satellite channels and a private bathroom with a bath or shower. Certain rooms have views of the garden or city. There is a 24-hour front desk at the property and free WiFi is available at the lobby. AccorHotels Arena is 2.4 km from Hôtel Verlaine, while Notre Dame Cathedral is 3.6 km from the property. The nearest airport is Orly Airport, 12.3 km from the property. Please note that this hotel is set over 3 levels and is not serviced by a lift. This double room has a flat-screen TV with satellite channels. Rate: € 60.60 ... € 114.00; select dates below to get current rates. 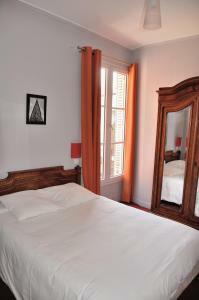 This double room is more spacious and has a flat-screen TV with satellite channels.